We are Red Elec Electrical Services, a well-established family run business in the North West that has traded for over 8 years providing a first class reliable service in all fields of electrical contracting Domestic and Commercial alike. All of our Electricians have approved status to City & Guilds standards and are fully conversant with the current 17th Edition IEE Wiring regulations BS7671: 2008 (amended). 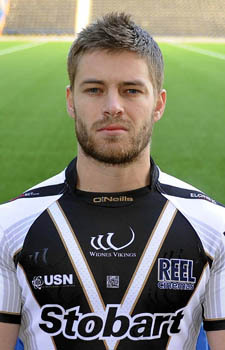 We currently sponsor Widnes Vikings Star Rhys Hanbury. We also try to work closely with Widnes Vikings and other community organisations and schools to help support the local community in Widnes, Runcorn, St Helens, Warrington and Liverpool. We also sponsor Widnes St Maries Vikings, Milan Park Football Club and Rugby Minis. At Red Elec our vision is simple. To be the best electrical company in our field; experienced, responsive, competitive, and on-schedule. These qualities translate into excellence and trust … the same trademarks that have carried our reputation for over 8 years. Electrical services in Domestic Properties. Giving you the confidence that, not only are you dealing with a well established and fully qualified electricial Company, but also that we are regularly checked to ensure that all our work is up to all safety standards for the work being completed in your home. And many more just ask!